Frankfurt / Vancouver, June 17, 2013 – At the 51th SID Display Week, eighteen German companies exhibit at the DFF initiated German Pavilion at SID Display Week in Vancouver. At this year’s SID Display Week, which takes place in Vancouver, Canada, the German Flat Panel Display Forum (DFF) presents 18 exhibitors from Germany. It is the tenth year in a row that the DFF organizes the German Pavilion together with the Association of the German Trade Fair Industry. The SID Display Week is the leading conference and show for the display industry and organised by the Society for Information Displays. At the SID international exhibitors represent the entire value added chain of the display industry and show the latest developments and technologies. Together with the joint symposium with scientific lectures focussing on this year’s main topics 3D, OLED TV, OXIDE TFT, lighting, touch and interactive display the show will present not only commercial products but will also feature prototypes and new technologies. 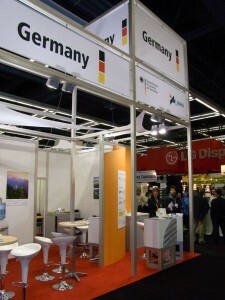 The German Pavilion gathers 18 exhibiting companies under one roof, the information booth, moreover, offers information on additional German companies of the display industry. More members of the DFF, like Merck as the worldwide leading manufacturer of liquid crystals, are represented with their own booths. More than 20 German companies show that they can very well compete on the international market. No other country except for the host is represented with such a large number of exhibitors. The focus of the German Pavilion is on new technologies: the company ELECTRONIC ASSEMBLY GmbH presents its intelligent display series with new features, some new members of its famous EA DOG and its new ePaper displays, PolyIC shows its flexible, transparent and conducting PolyTC® films and their applications. FHR Anlagenbau GmbH presents vacuum coating equipment for the functional coating of display glasses and display films. The Fraunhofer Heinrich-Hertz-Institut (HHI) provides its easy-to-use plugin-solutions for Adobe After Effects (AFX) and its new insights in a software based, variable and flexible solution for the adaption of viewpoints to any glasses-free displays. InnoLas Systems has developed a laser glass cutting system that offers distinct advantages over conventional processes. Innolas laser cutting uses ultra-short laser pulses that cut glass. MDI SCHOTT shows the newest ultra thin glass cutting technology by CO2 laser and adt Deutschland presents an electrowetting based and ultra-low power reflective display technology called “Droplet-Driven-Displays”.The Saarland University focuses on low power LCDs for Smart-Phones and Tablet-PCs, enabled by SSC local dimming algorithm. The scientific publishing house Springer Science + Business Media will present a selection of recently published titles in the display field, including the four-volume Handbook of Visual Display Technology and sim4tec shows its Organic Material Analyzer (OMA), a breakthrough in the analysis of any organic material. Together with VON ARDENNE Anlagetechnik GmbH Fraunhofer COMEDD introduces a technology that enables to pattern OLED microdisplays on sub-pixel level. Fraunhofer IPMS presents its micro-scanning mirror that can be produced cost-effective and in quantity on silicon-wafer and enable a targeted distraction of the incident light and AIXTRON SE shows its solutions for the separation of organic thin films, especially for OLED Displays, OLED Lighting and other applications in the field of organic respectively flexible electronic.With visitors from 30 countries the show definitely is an international one compared to other similar events. With its comprehensive range of products the SID covers the entire world market and that makes it a “must” for the international FPD-scene. You can find the German Pavilion at booth no. 1101 in the Vancouver Convention Centre. Besides the exhibition SID Display Week offers a unique first-class international symposium and accompanying seminars from May 21 to May 24. Further information can be found under www.sid.german-pavilion.com.